(Newser) – The 10 North Carolina plaintiffs who say a pork farm near their homes is endangering their health by, among other things, spraying hog urine and feces onto nearby fields, have won a big victory. A federal jury has awarded each plaintiff $5 million in punitive damages and $75,000 in compensatory damages, Modern Farmer reports. 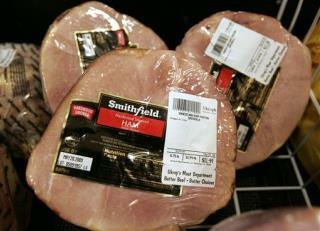 The more than $50 million in awards is to be paid by Smithfield Foods—the company for which the North Carolina hog operation, Kinlaw Farms, raises the animals. In their lawsuit, the plaintiffs complained of large pits holding hog feces that, in addition to causing horrible smells, attracted buzzards and insects. They say the sprayed feces sometimes even ends up in their homes, the Daily Press reports. Who would want to eat food products that's grown in fields of hog $hit and hog Pi$$? If open pits and spraying pig manure are the problem then the solution is to process it in a way that solves the problem such as burying the waste deeper or changing the waste into biofuel to eliminate the health hazards and smell. I suspect it it has already affected the ground water. It looks like the company wants to go the low cash route of bribing officials to let them do anything they want rather than fixing the problems. Spraying urine and feces into neighbors fields is low. The health concerns alone are terrible enough to warrant compensation. Smithfield should buy the neighbors out...worked before, and it is probably cheaper.